As our basic PDF reading needs are fulfilled by web browsers, the need for a free PDF reader software is decreasing. Still, there are some tasks like annotation, digital signature, form filling, etc. that need advanced PDF reader software. 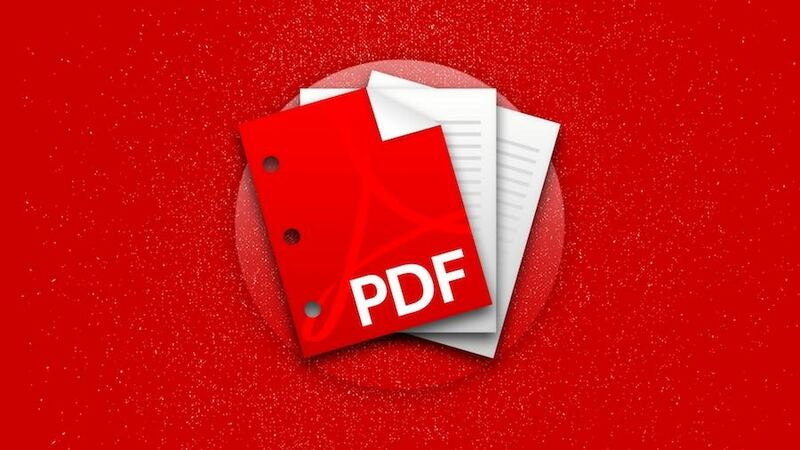 So, we’ve compiled a list of the top 8 best PDF readers for Windows PCs. This list includes the likes of Adobe Acrobat Reader DC, SumatraPDF, Foxit Reader, etc. 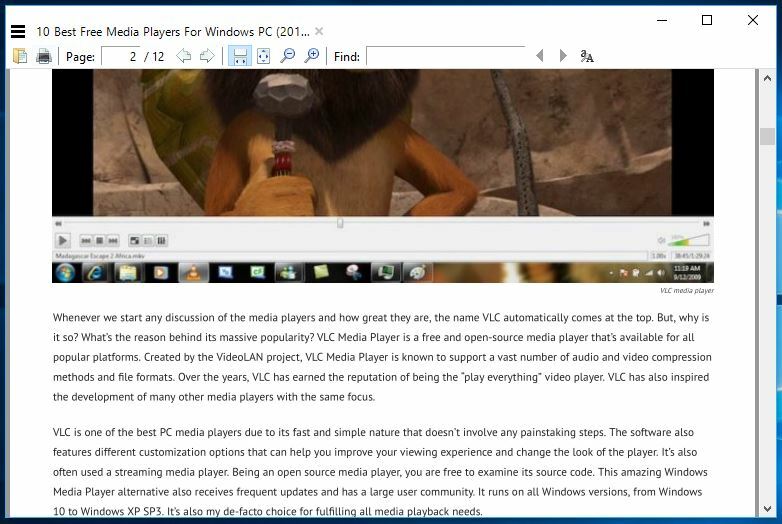 SumatraPDF is an open source and lightweight PDF reader software that you can install and use on your Windows computer. Licensed under GPLv3 license, SumatraPDF supports formats other than PDF as well, including the likes of EPUB, MOBI, FB2, CHM, XPS, and DjVu. As I mentioned above, this free and best PDF reader is very light and its 64-bit installer is just about 5MB in size. 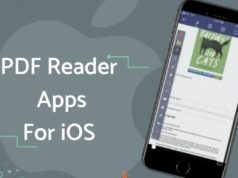 If you’re looking for the good PDF reader software that can simply deliver an amazing reading experience with fast performance and basic features, SumatraPDF is the right PDF reader for you. But, it lacks advanced features like annotations, document signing, and form-filling. It supports various keyboard shortcuts to help you navigate easily and improve the reading experience. Sumatra also comes with easy previewing of LaTeX documents and you can configure different text editors to integrate Sumatra. It also supports running in restricted mode. If you’re looking for a more powerful program to read PDF files, I’d like to recommend Adobe Acrobat Reader. It’s not uncommon to come across a PDF file that demands an advanced PDF reader. Here, I’m talking about the fillable forms that you can’t take care of using a basic PDF reader software for Windows. It’s still the recommended PDF solution for all tasks and the most popular of all the ones mentioned on this list. While you might find it heavier as compared to the likes of SumatraPDF, it turns out to be useful when all the other solutions fail. You can use it for reading in different modes, text highlighting, adding notes, filling forms, digital signatures, add stamps, etc. 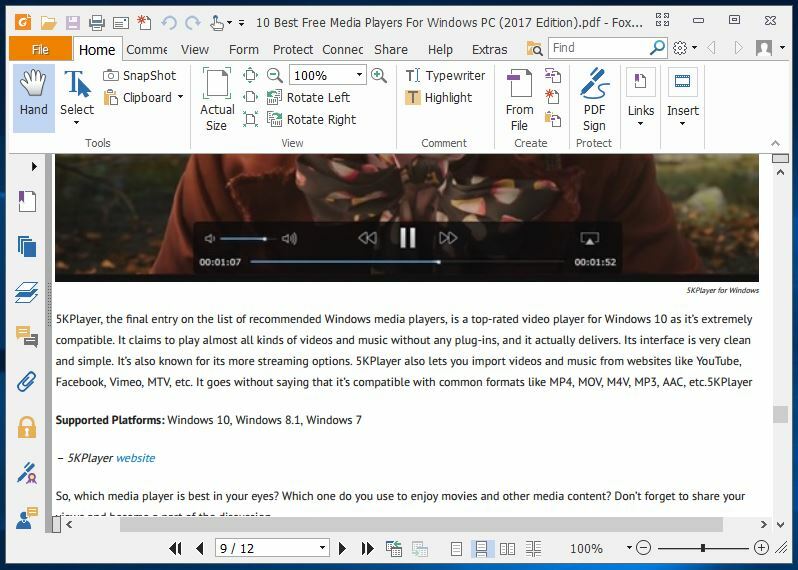 This free PDF reader for Windows also supports tabbed view, which means that you can open multiple PDF files simultaneously. So, if your needs aren’t simple, you don’t want to just “read” PDF files, and you need advanced features, downloading Adobe Acrobat Reader DC is the right choice. Also, it’s the best PDF reader for large files that some lightweight programs are unable to process fully. Note: On the download page of Adobe Acrobat Reader DC, the bundled options for McAfee Security Scan Plus and True Key by Intel Security are already selected. Make sure to untick them to avoid installing the software that you don’t need. I guess this was the main reason why I refrained myself it from keeping it at #1 spot. If your main demands are viewing PDF files and you don’t need features that come with advanced PDF reader software for Windows, you don’t need a dedicated software. Your web browser like Google Chrome, Firefox, Edge, or Opera come with integrated PDF readers. They are a part of your web browser and updated regularly with new features along with your browser. 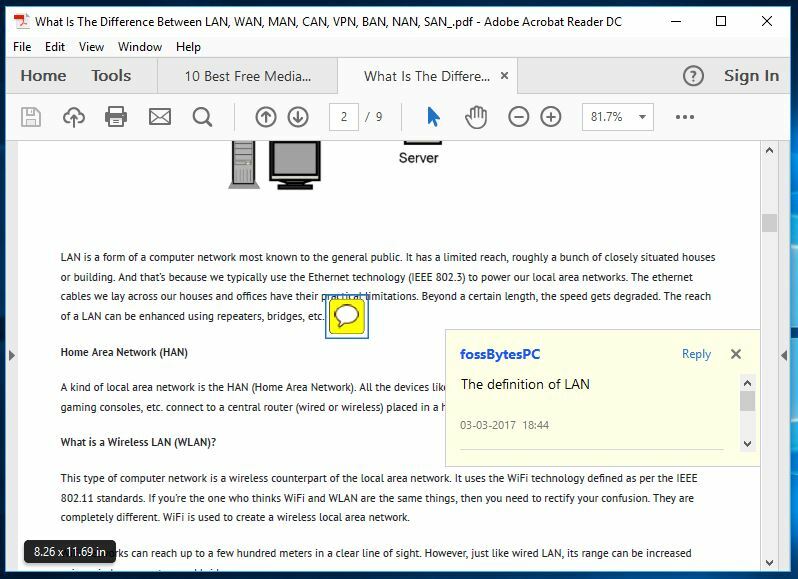 As you click on a PDF link, the web browser starts opening the PDF file on its own and provides you a clutter-free reading experience. All the browsers let you use features like adjustable text size, rotation, download, and printing. Just in case you want to open locally stored PDF files using your web browser, you need to simply drag it to an open browser window to open the file. You can also right-click on the file to choose your browser using “Choose Another App” option. So, if you don’t open or view PDF files regularly, your web browser is the best PDF reader you can get. Nitro Reader is another popular name. I personally like this free PDF document reader as it tries to strike the perfect balance between usability and features. It doesn’t come loaded with tons of unnecessary features that one never uses. 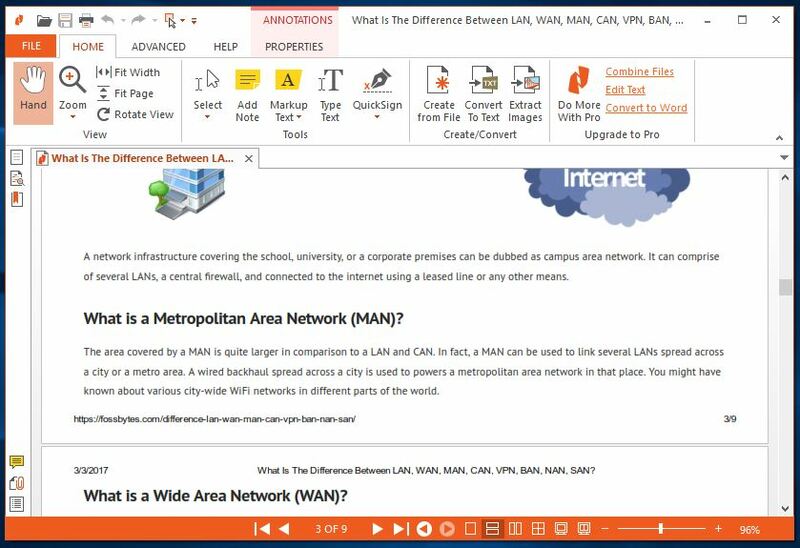 Its slick interface looks like just any other application from Microsoft’s Office suite. Apart from all the basic features, Nitro Reader also comes with a handy QuickSign feature for digitally signing documents a simple task. You can also secure your documents and make sure that they are opened by the people who’ve received a digital certificate from you. So, Go for Nitro Reader if you wish to use a no-nonsense PDF reader that also have a nice UI. 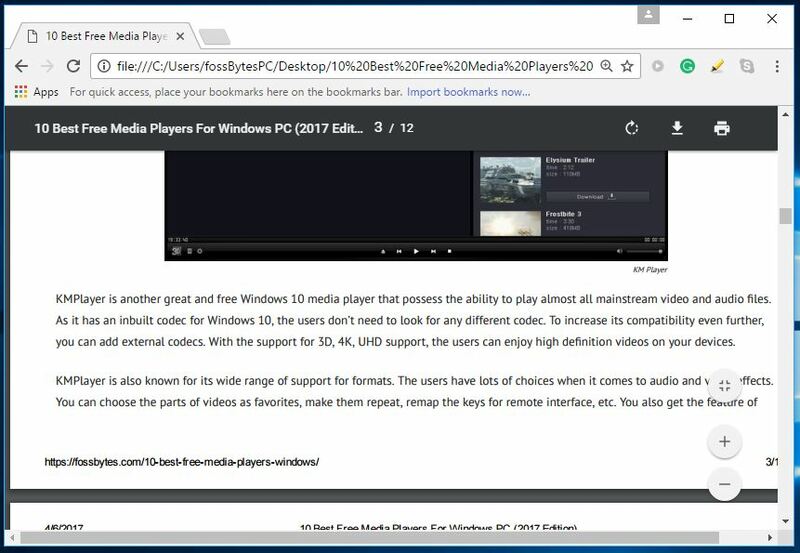 If you’re looking for an excellent and free PDF reader for Windows 10 or older versions of Microsoft Windows, your search might end with Foxit reader. 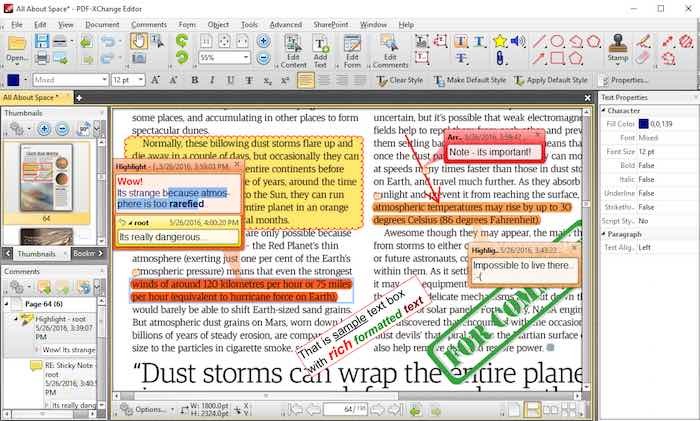 Just like Adobe Acrobat Reader DC, Foxit too is a popular name in the world of document readers. Compared to Adobe’s PDF reading solution, Foxit is comparatively lighter. Foxit’s website is well designed and it doesn’t try to ship some extra bloatware to your PC. However, it does try to install Foxit PhantomPDF editor’s 14-day trial during the installation process, so take a look at that. 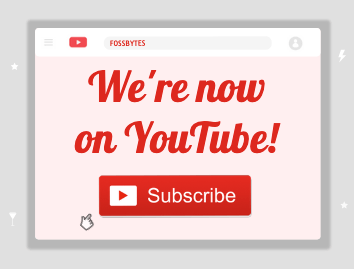 With its recent release in 2016, Foxit also introduced its new online ConnectedPDF Document Management System. Its Text Viewer mode removes complex formatting and displays a plain Notepad-like view of the file. The collaboration features further improve your PDF experience by letting you work online and share with others. It’s an advanced software for reading PDF files, and it comes will all the necessary features. 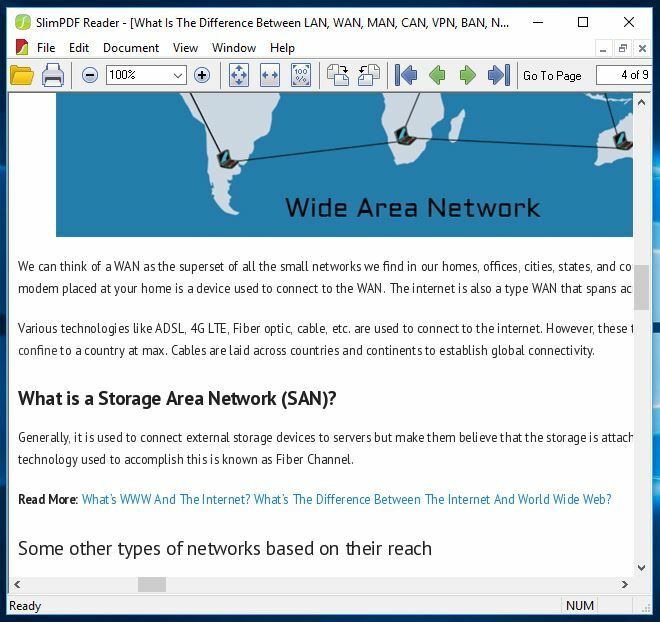 Just like SumatraPDF, Slim PDF is another lightweight and best PDF reader for Windows operating systems. It calls itself the world’s smallest desktop PDF reader. I don’t know about the validity of this claim, but its download size is of just 1.43MB. In my system, it was just about 5MB. So, if you’re looking for an extra small size PDF reader for your old computer, Slim PDF has the potential to end your search. Just as one would expect, this good and free software for reading PDF files is simply focused on reading, viewing, and printing your PDF files. It loads very quickly and lets you complete your job in less time. Please note that it doesn’t support many popular keyboard shortcuts, so don’t get disappointed due to that. Also, it doesn’t let you highlight you text word by word. Anyways, it’s a portable PDF reader software that just works. 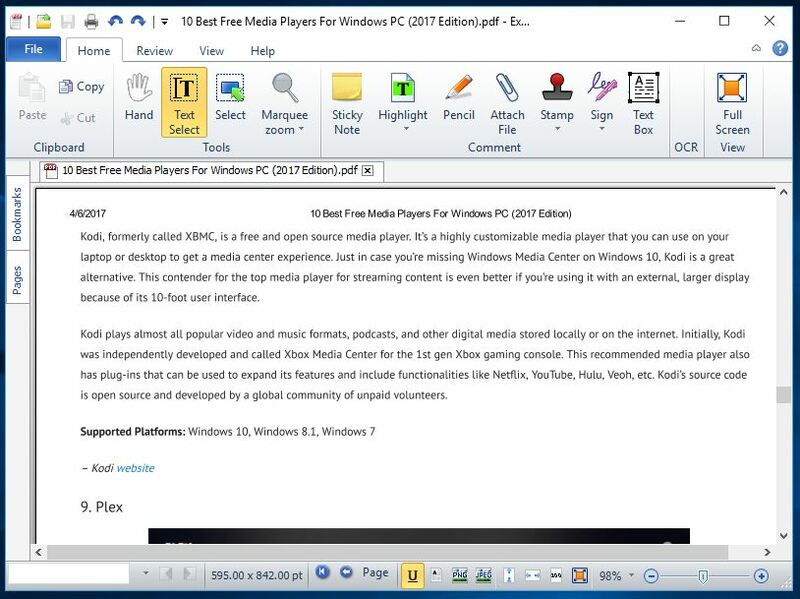 Expert PDF Reader is another free PDF reader for Windows that you can download and use to view PDF files easily. It comes with a new interface and all the basic features. You can add notes, highlight the text, create a text box, etc. You also get the facility of creating custom stamps and managing them. The signature feature is also included in Expert PDF Reader software. Last second-last entry on the top PDF readers list is Javelin PDF Reader. It comes with all the basic PDF reading functionality that one needs to complete daily chores. The overall interface is super clean and you can choose from most of the common reading modes like full screen, continuous, side by side, etc. Compared to the likes of Adobe Acrobat Reader DC and Foxit reader, Javelin is pretty lightweight. 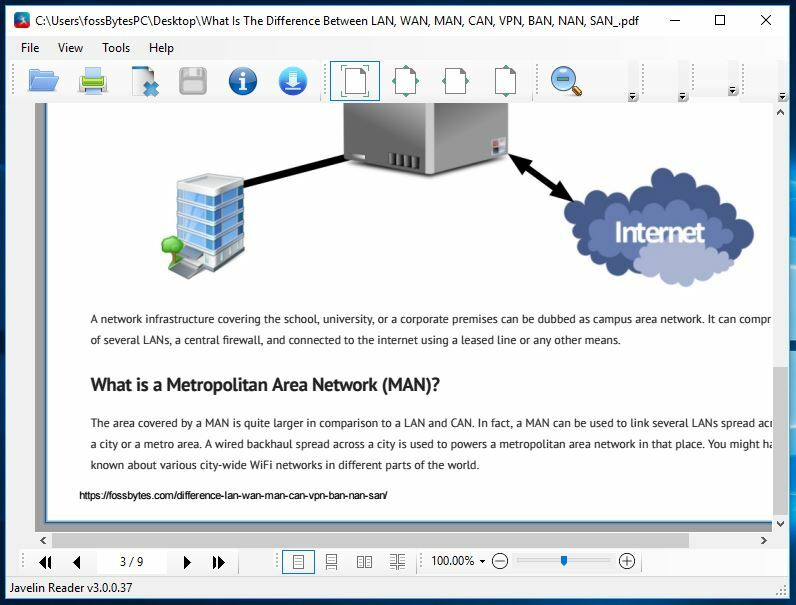 PDF-XChange Lite is a free PDF reader for Windows 10 that has been completely revamped and simplified. This software doesn’t take much time to open and provides a lightweight experience for reading, printing, annotating, saving images and text, etc. from a PDF file. Prior to this, the software was called PDF-XChange Viewer and it didn’t have the basic editing functions available for free. Evince document viewer was designed for GNOME desktop environment and it’s available for Windows 10 as well. 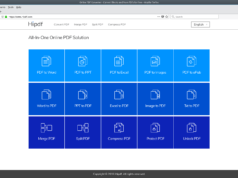 Apart from PDF, Evince also takes care of other formats like PostScript, TIFF, XPS, DVI, etc. Written mainly in C programming language, Evince has a clean and clutter-free interface. You have the option to customize the toolbar with different tools. 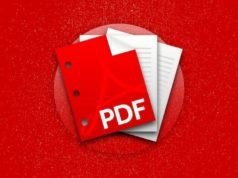 Which best PDF reader do you use? So, which free PDF reader software is your current favorite? 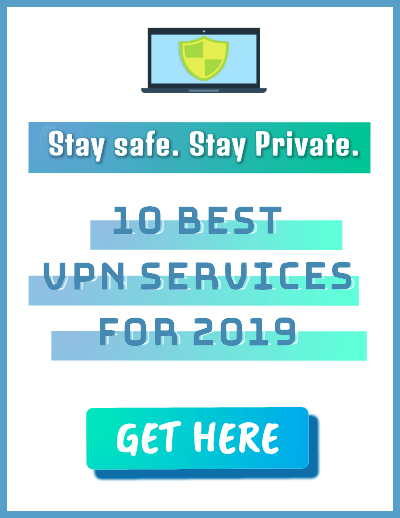 Depending on your usage and needs, your choices might defer but you’ll surely find a suitable solution on this recommendation list. Don’t forget to try them out and tell us your results.